• Add salt, asafoetida and ginger to the ground dal mixture. Mix well. • If you feel the mixture is too thin, you can add a little semolina to get the desired texture. • Now add Eno to the mixture and beat well. • Divide this mixture into equal portions and steam it in an idli stand. • Let the vadas cook in the steam for 10 minutes. • Now, to make dahi vadas, take a vada in a small plate. Add 3 table spoons of curd. Add sweet chutney and gren chutney as per taste. Sprinkle a pinch of black salt, red chilli powder and jeera powder. 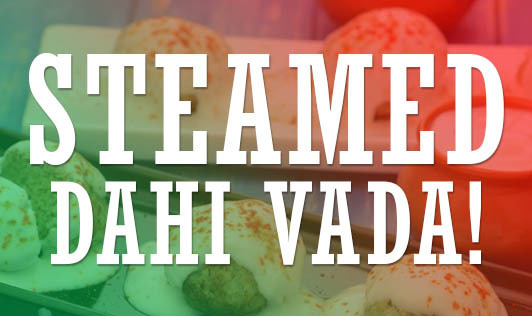 • Now your dahi vada is ready to serve. This chilled snack is ideal to beat the summer heat. It is high in proteins and calcium. This popular snack is delicious and yet nutritious!! !